Greenbush Lake Protected Area was established to protect important grizzly bear and mountain caribou habitat. The area also protects a good representation of old growth cedar, hemlock, spruce and subalpine fir found at mid to high elevation. Recreation opportunities include fishing, backcountry skiing and heli-skiing as well as nature appreciation. Access to the protected area during the summer is on an active logging road. Use caution and try to follow radio equipped vehicles. The area is remote and users must be well prepared. During the winter, heli-skiers access the Protected Area via CMH helicopter who hold a permit in the Park. Backcountry skiers most commonly access the park via Blanket Glacier Chalet, located just outside the park. There are no developed trails in the park, however a Recreation Site exists on the northern shore of Greenbush Lake providing rustic vehicle access camping. Greenbush Lake is located 124 km north of Vernon. Take Hwy 97 to Vernon, then go east on Hwy 6 from for 47 km, through Lumby to Cherryville. At Cherryville, turn north onto Sugar Lake Road. Follow until the paved road ends becoming the gravel Sugar Lake Forest Service Road. Follow past Sugar Lake and along the Shuswap River for 53 km to the protected area. The Forest Service Recreation Site on the northwest side of Greenbush lake is just outside the protected area which surrounds it on the north, east and south sides. The recreation site provides the main access into the protected area. The closest communities, towns and cities are Cherryville, Lumby and Vernon. In the winter, backcountry skiers fly by helicopter to Blanket Glacier Chalet, located just east of the Protected Area. The Chalet commissions these flights from Revelstoke. As well, heli-skiing trips in the Protected Area are provided by CMH Revelstoke. History: Established on April 18, 2001 as part of the Okanagan-Shuswap LRMP process. Cultural Heritage: There is evidence of trapping by European settlers. Conservation: The area is representative of the Central Columbia Mountains Ecosection. It contains old-growth Engelmann spruce-subalpine fir and Interior cedar-hemlock forest types with exceptionally large cedar and spruce. The protected area provides important spring range for grizzly and critical cedar-hemlock habitat for caribou. British Columbia contains most of the world’s population of Mountain caribou. They are blue-listed in British Columbia and depend heavily on old-growth forest to supply lichen for their winter diet. Increased habitat fragmentation and winter recreational use is putting pressure on remaining herds emphasizing the importance of the protected area. Wildlife: Caribou, black and grizzly bear, wolverine, marten, lynx, cougar, hoary marmot and pileated woodpecker, yellow-rumped warbler, brown creeper and the blue-listed Townsend’s big-eared bat are known to be in this area. Greenbush Lake Protected Area Approved Management Direction Statement [PDF] is available online in pdf format. Rainbow trout and dolly varden, some as big as 4.5 pounds, are caught in Greenbush Lake. Anyone fishing or angling in British Columbia must have an appropriate licence. Hunting is allowed in the protected area. Please check the BC Hunting and Trapping Regulations for more details. There are no vehicle accessible camping facilities at this park. However, just outside of the protected area there are 3 large, level campsites with fire rings as well as an old outhouse and boat launch. These are Forest Service recreation sites and may not meet BC Parks standards. 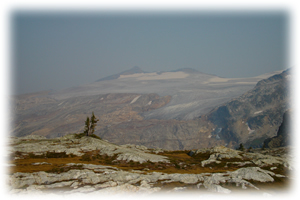 Blanket Glacier Chalet operates a winter-use lodge just east of the Protected Area boundary. From here, self contained skiers can tour into and around the Protected Area. Canadian Mountain Holidays (CMH) operates numerous heli-skiing operations in British Columbia including CMH Revelstoke which runs trips into the Monashee mountains including Greenbush Protected Area.